It may be the first time you’re leaving your country on your own, or maybe your first time going to another country for studying purposes. We understand that this may be overwhelming at first, but we can assure you that once you get to your destination, you will realise that this was a decision worth making. Because we have seen many students going through this initial worry, and also because some of us here at French in Normandy, have been in this position, we have decided to give you some tips which can help you get organised to study in France. French in Normandy is a member of Campus France and Groupement fle, a professional association of French language Schools in France. It is also a member of the international independent school’s quality organisation IALC and is recognized by Sweden’s CSN and Germany’s Bildungsurlaub and awards United States’ university study credits or ECTS (European Credits). This to you means that our school is obliged to offer quality services and customer care. 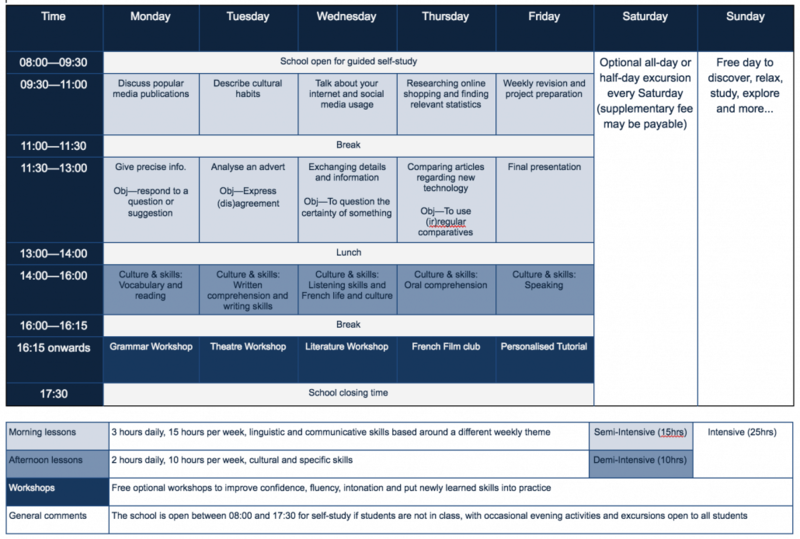 Below you will find a time-table of a typical 25-hour intensive programme. Over and above the lessons, we also organise activities to help students continue their immersion experience. We also recommend an accompanied full-day excursion or activity over the weekend. These will need to be booked and paid for at the school. If you prefer to do something different for free, every week Rouen Town Hall posts the cultural agenda for the week ahead in Rouen and there are many events and concerts that are free of charge. The school also offers information about transport and place of worship. Rouen is a big shopping centre and offering all the major shops, chains and department stores including Printemps and Galeries Lafayette. The FNAC is the biggest electronics store including music, movies and books etc. If you want to buy something in particular ask one of our staff who can advise you where to go. Just 3 minutes away from the school, is a boulangerie and a café with a special French in Normandy lunch special, as well as the supermarket Intermarché (large) or Cocinelle (small) and the school has its own Boulangerie Paul outlet. Before your trip to France to study French you will need to find out about the visa requirements. You should do this well ahead of time as sometimes getting all the official documents together can take a while. If you are a citizen of the European Union you will need either a valid passport or an identity card depending on your country of origin and you will not need a visa, of course! For non-EU students you may need to apply for a student visa for France for stays more than 90 days. Stay tuned on the blog for a detailed study in France visa guide. Keep in mind that, if after you have begun your course, you decide to cut your course short and/or your stay in France and have been issued a French visa on the basis of an invitation letter from French in Normandy, we are obliged to inform the appropriate authorities if you stop your course. We are also obliged to inform the appropriate authorities if you are repeatedly absent. If you will be staying in Rouen for a long time and would like to take an unscheduled holiday during your course, this is possible. There is a procedure in place which can be explained in further detail to every individual, depending on the length of stay and holiday period. It is not usually very cold in Rouen, but it can be wet, especially in the early spring, so bring a warm waterproof coat. We would also recommend sensible and comfortable shoes for walking and for going on excursions. In winter, we do not usually have snow, but it can be windy so a scarf, gloves and a hat might be a good idea! A beer or coke in a café about 3.50 €. Rouen is not a dangerous place, but the usual precautions apply. Do not carry lots of cash on you, do not walk around the town late at night on your own and do not attract attention to yourself by screaming and shouting which people of all nationalities always seem to do in a foreign country!! We hope this information has been useful to start planning your trip to Rouen. If you need further information we are always happy to help. Contact us or call on +33 (0) 2 35 72 08 63.